Recently I was blessed to attend a breakfast hosted by the ministry of a dear sister-in-Christ. Her ministry is raising money to go to Uganda and dig a new well. There is much involved in digging a well, most particularly in Uganda, which is a nation in the continent of Africa. Apparently in the metropolitan areas there is running water, but in the remote parts of Uganda, where my friend is bringing a team, that is not the case. At this time the people live 6 miles from the closest well. 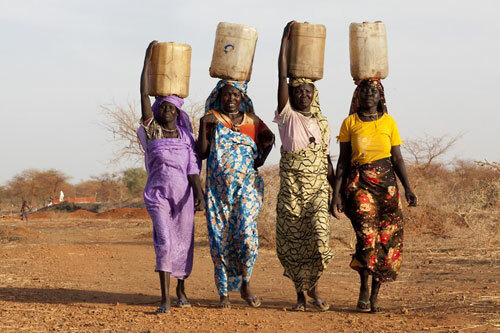 Every day women carry their water container on their head to the well and return the same six miles with the heavy container filled with precious water on their head. Those who know Jesus spend their time going and coming in worship and praise to the Lord our God. WOW! It really gave me pause to consider the value of clean, available drinking water. Let us consider what the Word of God says about a well. God often used the symbolism of a well. Dear one…perhaps just for today… each time you take a drink of water give thanks for the Word of God and Jesus, the Word of God that became flesh and dwelt among us. Give thanks for the well of salvation made available to you that can now be a fountain of living water within you. Let Jesus fill you up to overflowing! Praise His Holy Name! !